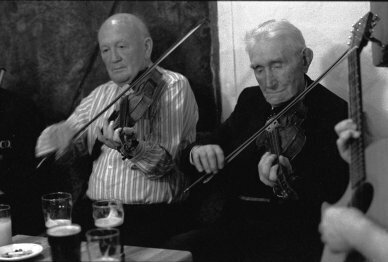 Live recordings of Irish traditional music sessions from 1961 to 1977 featuring Willie Clancy, Bobby Casey, Seamus Ennis, Martin 'Junior' Crehan, John Kelly, Paddy Canny, Miko Doyle, Thady Casey, James Flynn, JC Talty, Angela Crehan, Ita Crehan, Paddy Fahy, Martin Talty, PJ Crotty, Christy Dixon, Martin O'Brien and more. Sessions were recorded in 'Junior' Crehan's Home, Bonavella, Mullagh; in Thady Casey's home, Annagh, Mullagh; in John Joe Healy's home, Spanish Point; in Paddy Canny's home, Kiltannon; in Paddy Fahy's home, Aughrim; and in Swindon, UK. Clare County Library is grateful to Pat Mackenzie and Jim Carroll for enabling us to make John Joe Healy’s collection of audio recordings of traditional music sessions available. We are also grateful to Peter Laban and Pat Mackenzie for allowing us to use photographs from their collections, and to Mary Custy and Paddy Comber for their help in identifying tunes. Bobby Casey & Martin 'Junior' Crehan, 1996. Photo © Peter Laban. At the Willie Clancy Summer School, 1974. Standing: Junior Crehan; Peadar O'Loughlin; Muiris Ó Rócháin; Paddy Joe McMahon; J.C.Talty. 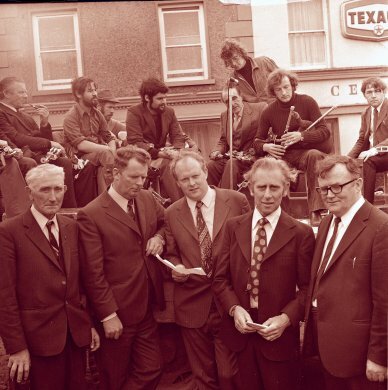 On stage, Willie Reynolds; Wilbert Garvin; Bill Ochs; Pat Lavin; Liam Óg Ó Floinn; Des Shannon. Standing behind, Ronnie Wathem. Photo Michael John Glynne © Clare Local Studies Project .